Muriel Rukeyser held a visionary belief in the human capacity to create social change through language. She earned an international reputation as a powerful voice against enforced silences of all kind, against the violence of war, poverty, and racism. Her eloquent poetry of witness - of the Scottsboro Nine, the Spanish Civil War, the poisoning of the Gauley Bridge laborers - split the darkness covering a shameful world. In addition to the complete texts of her twelve previously published books, this volume also features new poems discovered by the editors; Rukeyser's translations, including the first English translations of Octavio Paz's work; early work by Rukeyser not previously published in book form; and the controversial book-length poem ""Wake Island"". An introduction by the editors traces Rukeyser's life and literary reputation and complements discerning annotations and textual notes to the poems. 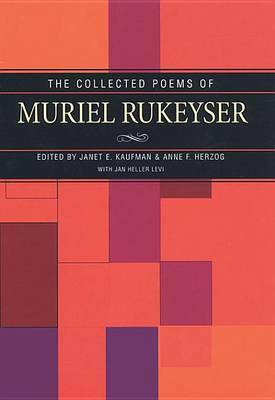 Buy The Collected Poems of Muriel Rukeyser by Janet E. Kaufman from Australia's Online Independent Bookstore, Boomerang Books. JANET E. KAUFMAN is assistant professor of English at the University of Utah. ANNE F. HERZOG is associate professor of English at West Chester University. They are coeditors of ""How Shall We Tell Each Other of the Poet? "": The Life and Writing of Muriel Rukeyser. JAN HELLER LEVI'S Once I Gazed at You in Wonder won the 1998 Walt Whitman Award. She is working on a biography of Muriel Rukeyser.